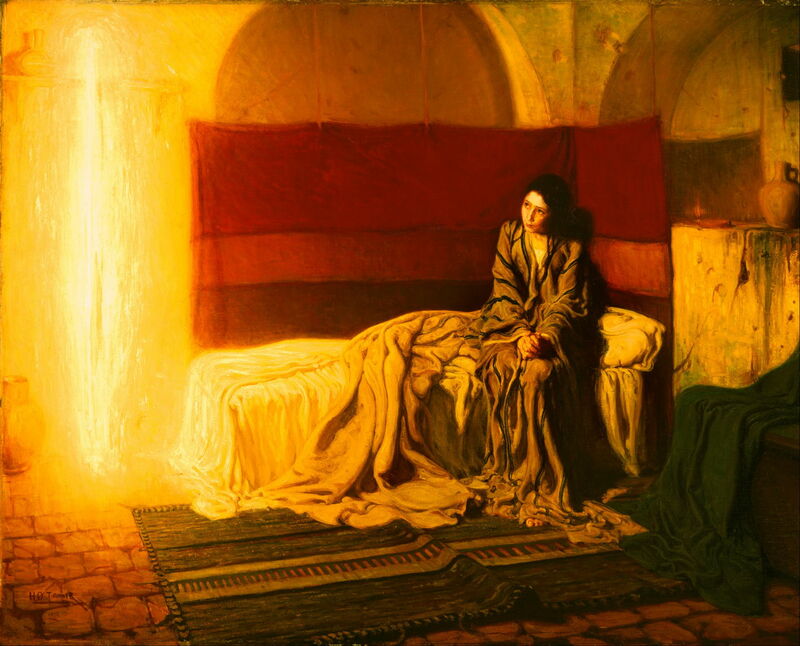 Henry Ossawa Tanner (1859–1937), The Annunciation (1898), oil on canvas, 144.9 x 181.1 cm, Philadelphia Museum of Art, Philadelphia, PA. Wikimedia Commons. In his day, Henry Ossawa Tanner (1859–1937) was a truly international artist. Born in Pittsburgh, Pennsylvania, and trained in Philadelphia, he worked for the most of his long career in France, where he was made a Knight of the Legion of Honour. He was the first African-American painter to achieve international recognition. Yet today almost all his paintings are back in the US, and he is little known in Europe. He was born into a well-educated and relatively affluent family, his father being a minister in the African Methodist Episcopal (AME) Church who was elected bishop in 1888, although his mother had been born into slavery. He was first inspired to become an artist in 1872, and had begun painting as an amateur by 1876. He was first apprenticed in the flour trade, and it was only after an illness, in 1878, that his parents agreed to him pursuing a career as a painter. In 1879, he started studies under the brilliant but controversial Thomas Eakins (1844-1916) at the Pennsylvania Academy of the Fine Arts, in Philadelphia. Although it is often claimed that he was the only black student there at the time, there was at least one other. Eakins was an enthusiastic photographer at this time, and it is likely that Tanner learned photographic techniques under him. Within a couple of months, in early 1880, Tanner was exhibiting in Philadelphia, and had sold his first painting. Henry Ossawa Tanner (1859–1937), The Laundress (1880), media and dimensions not known, Amistad Research Center, New Orleans, LA. Wikimedia Commons. The Laundress has been claimed to date from 1880, which would make it one of the earliest of his paintings still in existence. It shows not one but three women washing laundry near a homestead in the country, with the sky dark of an approaching storm. Tanner’s brushwork is remarkably painterly, giving the work a distinctly impressionist appearance. Henry Ossawa Tanner (1859–1937), Sand Dunes at Sunset, Atlantic City (c 1885), oil on canvas, 76.7 × 151 cm, The White House, Washington, DC. Wikimedia Commons. 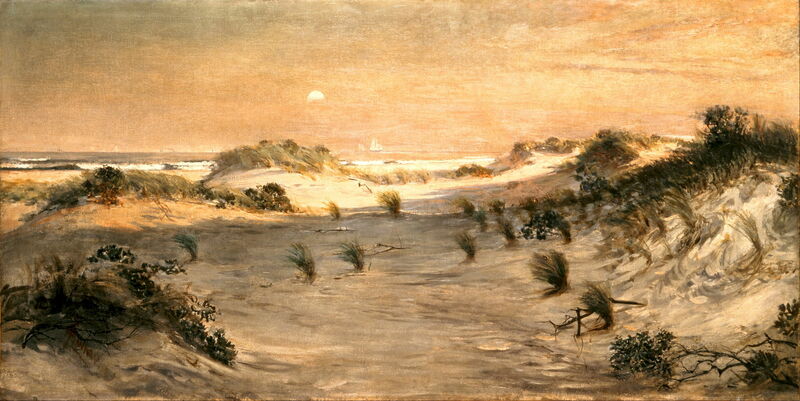 Sand Dunes at Sunset, Atlantic City (c 1885) is better established as one of his early works, and is more thoroughly Impressionist in its style, showing a fleeting moment as the sun sinks over the sea. In 1885, Tanner exhibited his first painting at the National Academy of Design in New York, and it sold there. He was sufficiently encouraged that the following year he rented his first studio in Philadelphia. In 1888, he modelled and cast the bust of his first patron, another bishop of the AME Church. In January 1889, he moved to Atlanta and opened a photographic gallery and studio. Although this helped him make many contacts, as a business it proved unsuccessful, so that autumn he started work as a drawing instructor at Clark University, Atlanta. He left Atlanta for Rome in January 1891, but when he visited Paris en route for Italy, he decided to stay there instead. He then started studies at the Académie Julian, under Joseph Benjamin Constant and Jean-Paul Laurens. He soon made friends with Rodman Wanamaker, who was running the major US retailer’s branch in Paris, and became an important patron. Tanner spent the summers out of Paris, usually painting in Brittany, until he suffered an episode of typhoid fever in 1893. He returned to the US to recover from that, where one painting of his was shown at the World’s Columbian Exposition in Chicago. Henry Ossawa Tanner (1859–1937), Spinning By Firelight – The Boyhood of George Washington Gray (1894), oil on canvas, 118.1 × 168.9 cm, Yale University Art Gallery, New Haven, CT. Wikimedia Commons. 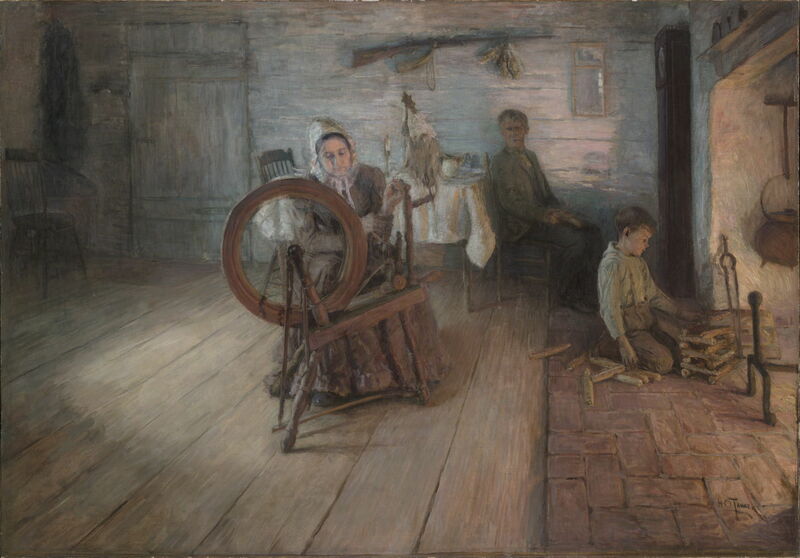 Spinning By Firelight – The Boyhood of George Washington Gray (1894) is one of a group of genre paintings made by Tanner in the mid 1890s, which started with his first very successful work, The Banjo Lesson (1893). In keeping with the others, this shows the spartan living room of a small, poor country family. It was commissioned by the same George Washington Gray (1834-1913), who was by that time a Chicago Methodist Episcopalian Minister, educator, and social reformer. In May 1894, Tanner had his first work accepted for exhibition in the Paris Salon; he exhibited there annually until 1914. Henry Ossawa Tanner (1859–1937), The Thankful Poor (1894), oil on canvas, 90.2 x 112.4 cm, Private collection. Wikimedia Commons. 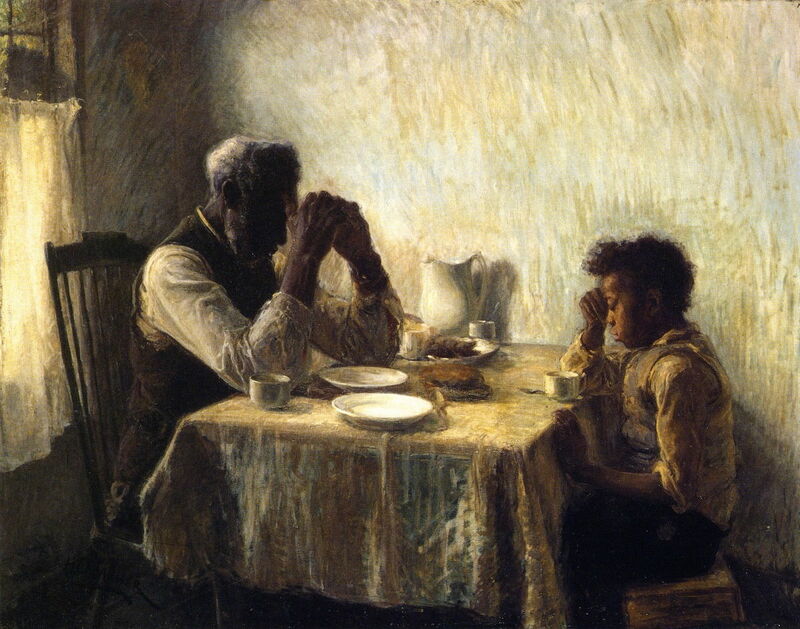 The Thankful Poor (1894) is another famous painting from this group. Sometimes claimed to be the first such depiction of an African-American family, Eakins and Hovenden had already painted similar. What is most distinctive about Tanner’s is that it was a conscious effort to counter the caricatures which were then so popular, and that it was respectful and naturalistic without being patronising. He sold this painting in the autumn of 1894, to provide the funds for him to return to Paris. Henry Ossawa Tanner (1859–1937), The Young Sabot Maker (1895), oil on canvas, 120.3 × 89.9 cm, Nelson-Atkins Museum of Art, Kansas City, MO. Wikimedia Commons. 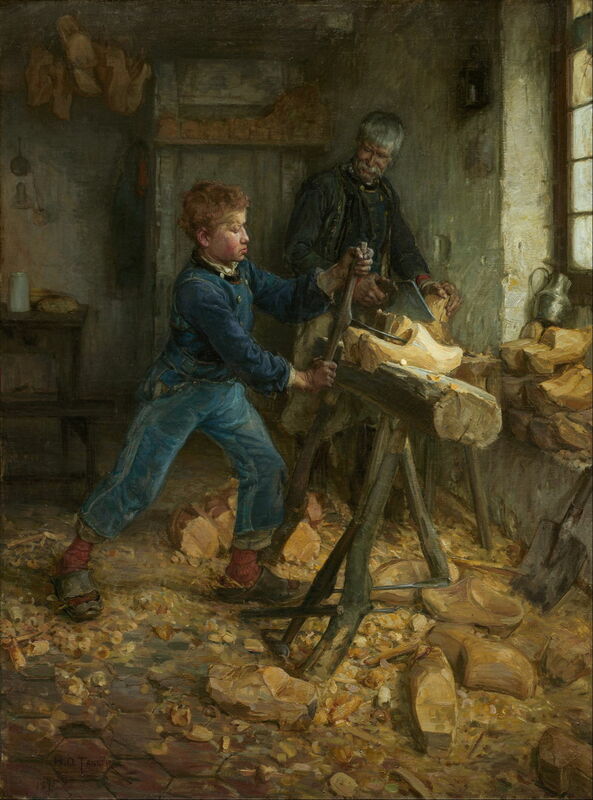 The Young Sabot Maker (1895), which was shown in the Paris Salon of that year, was one of the last of this small group of genre works, and a reflection on the theme of apprenticeship and learning skills, at a time in Tanner’s career when he felt that he had completed his own training at last. Sabots, or clogs, were also an emblem of the working class throughout Europe, particularly in rural Brittany. Henry Ossawa Tanner (1859–1937), Les Invalides, Paris (1896), oil on canvas, 33.3 × 41 cm, Terra Foundation for American Art, Chicago, IL. Wikimedia Commons. It is often forgotten that, despite being an American and occasionally returning to the US, Tanner lived in and painted France. 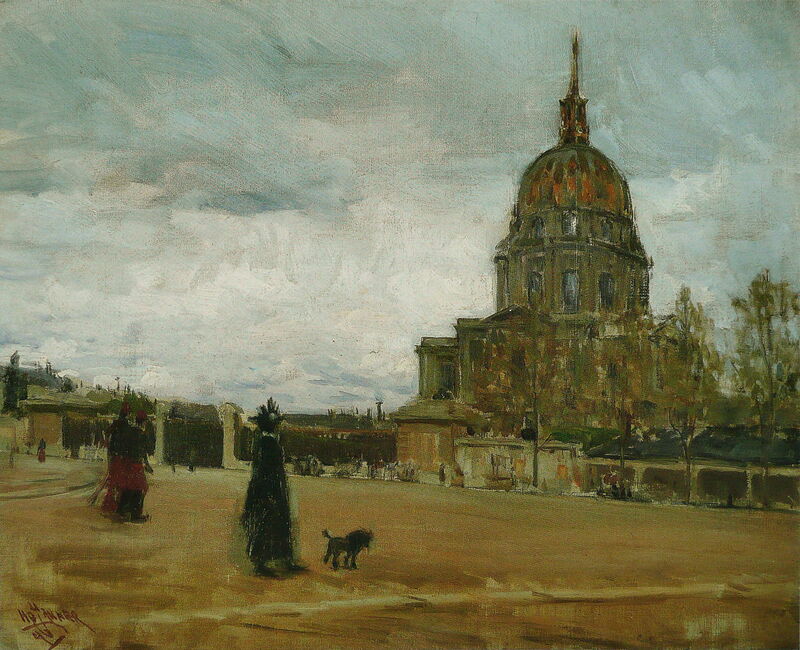 He is not known for his French landscapes, but in works such as his Les Invalides, Paris (1896) showed the development of a distinctly Post-Impressionist style. Henry Ossawa Tanner (1859–1937), The Resurrection of Lazarus (1896), oil on canvas, dimensions not known, Musée d’Orsay, Paris. By Rama [CeCILL (http://www.cecill.info/licences/Licence_CeCILL_V2-en.html)%5D, via Wikimedia Commons. 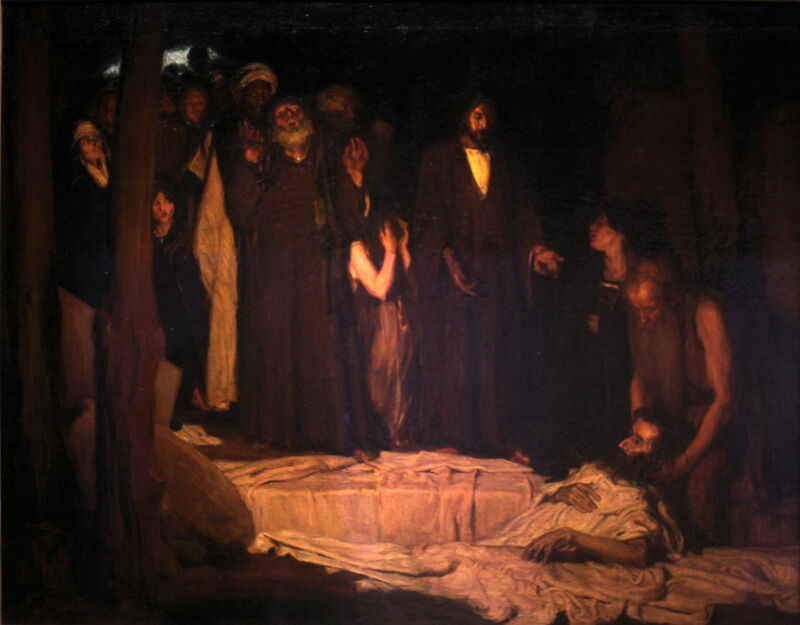 Tanner’s The Resurrection of Lazarus (1896) is his first great religious painting, and an early example of his use of limited colour. This shows the very popular story of Christ bringing Lazarus back to life after he had already been interred in his tomb – see this article for details and some pre-Renaissance examples. His approach to telling this familiar story is naturalist and an excellent example of good narrative painting. He transports the crowd of friends and relatives to the inside of Lazarus’s tomb, and shows the moment of climax, as Jesus brings the corpse back to life. This painting was awarded a third-class medal at the Salon the following year, and was purchased by the state for the Musée du Luxembourg: a great honour for an African-American. The previous year, his first Daniel in the Lions’ Den (1895) had received critical acclaim at the Salon, but that canvas has been lost since, and was not bought by the French state. Marc Simpson provides a detailed account of these works in Marley (2012) which is well worth reading. Henry Ossawa Tanner (1859–1937), Portrait of the Artist’s Mother (1897), oil on canvas, 74.3 x 100.4 cm, Philadelphia Museum of Art, Philadelphia, PA. Wikimedia Commons. Portrait of the Artist’s Mother (1897) was conversely not intended for public consumption, and as a personal work must rank among Tanner’s best paintings. 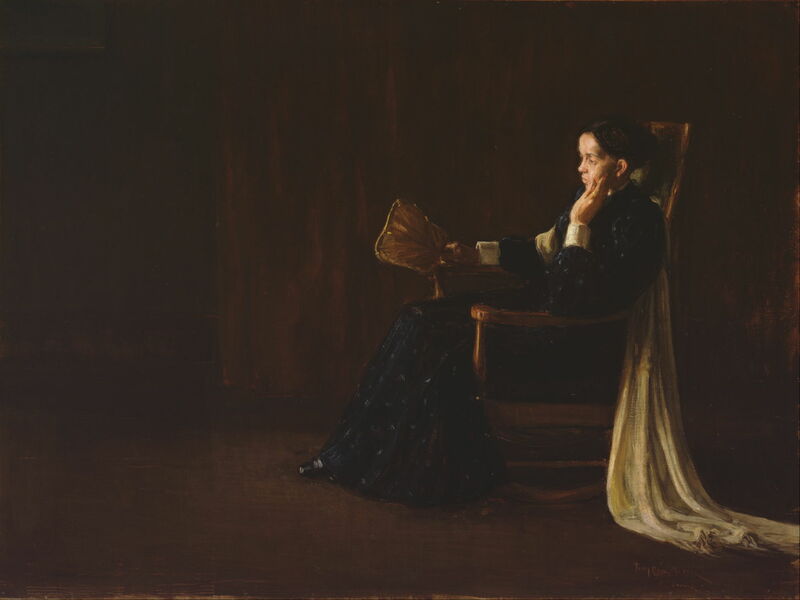 As a student he must have seen Whistler’s famous portrait of his mother (1871), which was exhibited in Philadelphia in 1881, when Tanner was a pupil of Eakins. Coincidentally, Whistler’s painting was bought by the French state in the same year that Tanner arrived in Paris, 1891. Adopting a very similar composition, Tanner’s portrait is both more intimate and sympathetic than Whistler’s, reflecting the very different relationships between the artists and their mothers. That year, Tanner travelled to, and painted in, Palestine and Egypt, thanks to the support of Rodman Wanamaker. On his way back he toured Italy, then in the summer visited the US. 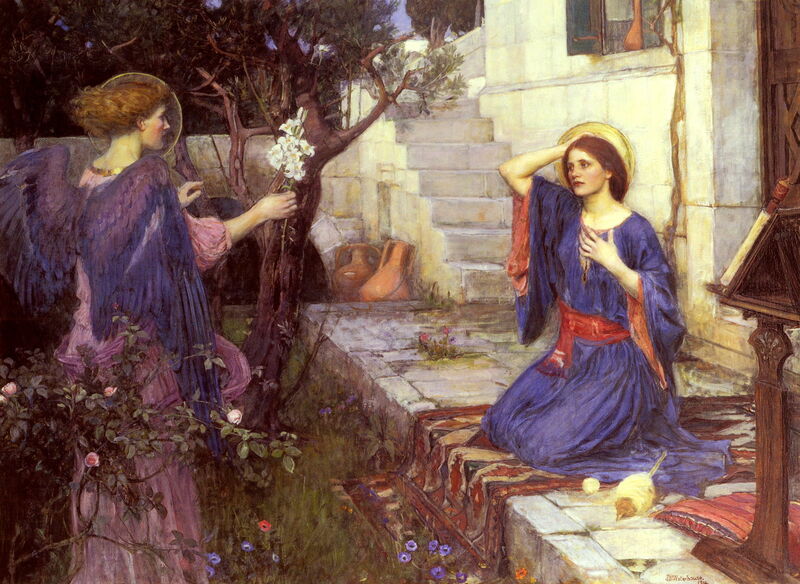 The Annunciation (1898) is one of Tanner’s most unconventional paintings of a very traditional scene, the announcement by the angel Gabriel to the Virgin Mary that she was to conceive and become mother of Jesus Christ. To appreciate how radical this painting is, compare Tanner’s with JW Waterhouse’s more modestly unconventional painting more than fifteen years later. Tanner sets the scene in the private space of Mary’s bedroom, the bedclothes rumpled untidily, and Mary in very casual night dress. There is no angel, as such, but a dazzling fire of the spirit, which makes a subtle crucifix with a shelf behind. This painting was accepted for the Salon of 1898, and became a popular reproduction in magazines. Through the winter of 1898-99 he made a second visit to the Middle East, following which he married Jessie Macauley Olsson, a Swedish-American opera singer, in London. Henry Ossawa Tanner (1859–1937), Salome (c 1900), oil on canvas, 116.5 × 89.4 cm, Smithsonian American Art Museum, Washington, DC. Wikimedia Commons. 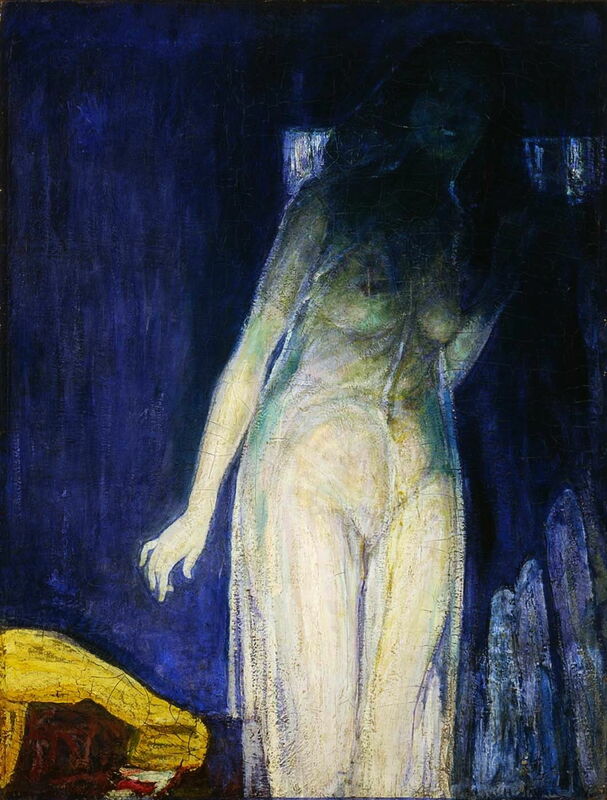 As The Annunciation had explored unusual lighting, so his Salome (c 1900) was a combination of lighting effects, the vogue for Salome at the time, and a famous contemporary dancer (who specialised in the use of such lighting effects). Here it is not just John the Baptist who is decapitated, but apart from the faint flash of her teeth, darkness accomplishes the same for Salome herself. Tanner probably used the new electric lighting to achieve this effect in the studio, and must have come closest to showing a sensuous female figure since his early days as a student painting from casts. In 1900, his Daniel in the Lions’ Den was awarded a silver medal at the Exposition Universelle in Paris. 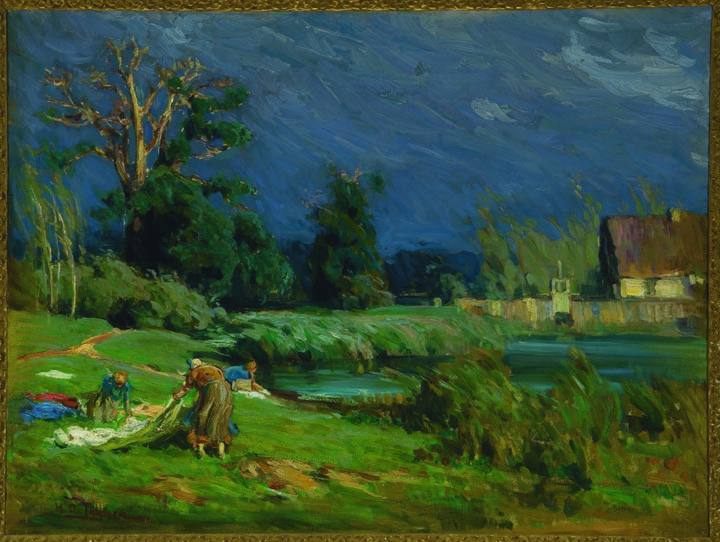 Henry Ossawa Tanner (1859–1937), The Seine (c 1902), oil on canvas, 22.8 × 33 cm, The National Gallery of Art, Washington, DC. Courtesy of The National Gallery of Art, via Wikimedia Commons. 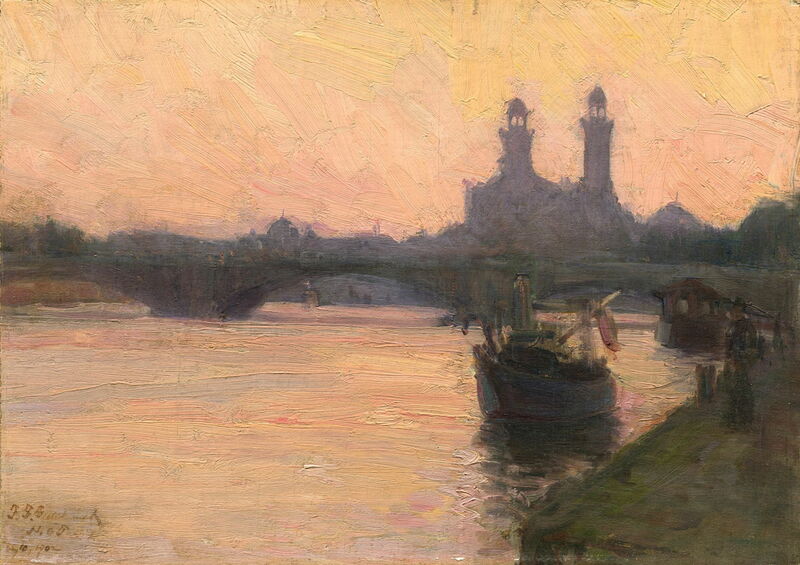 Lest we forget, Tanner’s output at this time was not confined to the religious: he continued to paint fine Post-Impressionist landscapes, such as this fine twilight view of The Seine (c 1902). The next article will complete this account of his career, with examples of his works from 1903 onwards. Posted in General, Painting and tagged African-American, painting, Post-impressionism, realism, Tanner. Bookmark the permalink. I have an undiscovered H.O. Tanner painting, that has been in my family for over a hundred years. It is a beautiful painting of an African Village, it is an oil on canvas painting, signed H.O. Tanner on the painting and frame and looks like the frame may have been made by Tanner himself. If you are interested or know anything on this painting please contact me. I am trying to find out more professional insight on exactly what it is that I have. And am possibly looking to sale it. I recommend that you get a good high-resolution digital image made of it. Then make contact with your nearest large public art gallery or collection, and seek someone there who is familiar with Tanner’s work. You should then be able to send them an image for them to have a preliminary look at, and point you in the right direction. I wish you success, and hope that your hopes are realised. Unfortunately a lot of paintings end up bearing names which mislead: a signature is no guarantee that the painting was made by that artist, I am afraid. If you have already had experts who have looked at good images of your painting and consider that it is not likely to be by Tanner, then it is very unlikely to be by him. You might be able to get a commercial dealer to visit and look at the painting, but again they are likely to want to see images of it first. In regards to my Henry Oswald Tanner painting, the reason why I don’t like to send images, and I will not send more images is because it does not reflect the true painting that I have. All these experts who suppose to know about Tanner, even the Philadelphia Gallery and Museum told me that it couldn’t be a Tanner, cuz Tanner mainly painted religious paintings, and would not have painted a beautiful painting like I have, but they are wrong. I was talking with another expert and he told me to get a black light, and shine it on the painting with the lights out. I was so surprised of what I saw mainly on the back looks like he had painted anoter painting and signed his name several times. I see his whole name, I see H O Tanner. I don’t think that over a hundred years ago that someone was copyig Tanner painting and signing his signature. What I want to do is to arrange for someone to come to see my painting, or for me to bring the painting to them to see. This is the painting of an African village by the river, it’s 30 x 24, oil on canvas. Like I said, I want some expert to come and see my painting and then tell me I’m wrong. So if anyone is interested please write me back and let me know. Eventually I will prove that I have an undsicovered H O Tanner painting. I think the painting was painted in 1879 and that’s the year that he enrolled in the arts school. So prove me wrong I have an undiscovered H O Tanner painting.